A cultivar of Erythrina x bidwillii Lindl. which is a hybrid of Erythrina herbacea L. x Erythrina crista-galli L. A sterile hybrid produced at Camden. A spiny shrub with leaves composed of 3 obovate to cordiform leaflets, the terminal one larger, intermediate in habit between Erythrina herbacea L. and Erythrina crista-galli L., which see for further details. ‘Blakei’ conforms more closely to the E. herbacea female parent in not forming a distinct trunk but a large, squat bole from which long arching shoots emerge in the spring. It flowers on both long terminal racemes, to 30cm or so long, and smaller axillary clusters. Our observation is that it flowers better from last season’s wood so some care in pruning will probably produce more flowers. Well grown plants will produce a large number of flower spikes in the spring and early summer and spot flower throughout the summer. The flower shoots are of a purplish colour and the flowers a brilliant intense red colour, approaching vermillion, much brighter than either parent, equally striking in bud and with the large standard expanded. Bred at Camden Park in the 1840s by William Macarthur and named for his convict gardener Edmund Blake. Listed in the 1850 and 1857 catalogues [T.422/1850] together with Erythrina Camdeni [Erythrina x bidwillii Lindl. var. ‘Camdeni’, which see]. Macarthur described Blakii and Camdeni to Loddiges’ Nursery, to whom he wrote on 16th April 1846 sending plants: ‘The varieties of Erythrina are both well worth cultivating and are about as hardy as E. cristagalli from which they are derived by crossing. Their flowers although somewhat smaller are of much more brilliant colour.’ [MP A2933-1, p.147]. ‘Camdeni’ has not survived in the gardens but there is a single plant, now identified as ‘Blakei’, growing in a hedge of Wisteria sinensis in a sheltered position close to the house. This plant appears much younger than the specimens at Melbourne and it seems likely that it was originally grown in the Lower Garden and only planted near the house after the closure of the Lower Garden, which occurred about 1947. Several plants identified as Erythrina x bidwillii ‘Blakei’ survive in the Royal Melbourne Botanic Gardens. They appear to be identical with the single plant surviving in the gardens at Camden Park which had been previously been identified as Erythrina x bidwillii Lindl., although whether the form ‘Camdeni’ or ‘Blakei’ was not known at the time. The RMBG plants examined appear to be very old, with boles 2-3 metres in circumference but only a metre or so high, with innumerable long arching shoots emerging from them. The flowers, shoots and leaves appear identical to the Camden Park specimen. Based largely on this evidence, and in the absence of any other descriptions of ‘Blakei’, we have identified the remaining plant at Camden Park as William Macarthur’s Erythrina Blakei. The appropriate botanical name for this plant appears to be Erythrina x bidwillii Lindl. ‘Blakei’. Unfortunately the provenance of the RMBG plants is not known and we can only speculate on their source. Ferdinand Muller, Director of the Melbourne Botanic Garden between 1857 and 1873, was a great friend of William Macarthur, indeed Muller named a plant, Randia macarthuri, in honour of William. It seems likely that Macarthur gifted the plants to Muller for the Melbourne garden. The RMBG also has in its collection a number of plants identified as Erythrina x bidwillii, with the somewhat misleading common name of Bidwill’s Coral Tree. The Brisbane Botanic Gardens at Mount Coot-tha has several plants identified as Erythrina x bidwillii. 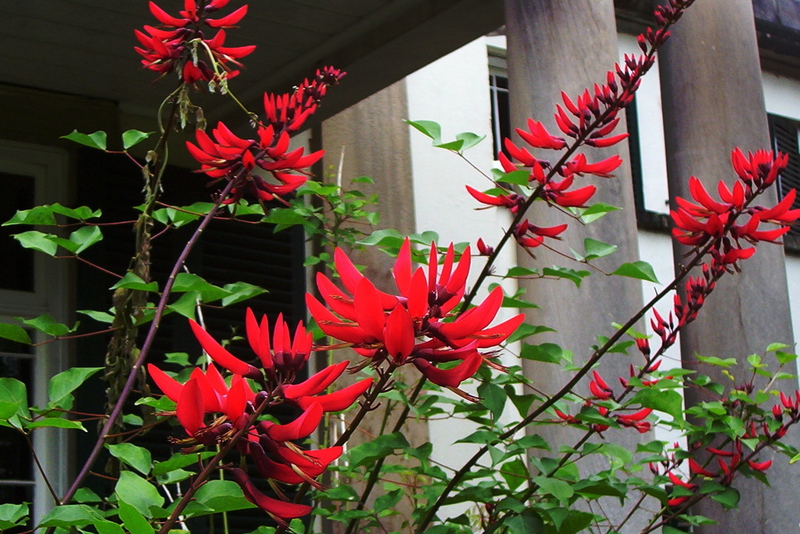 For more information on these plants see Erythrina x bidwillii Lindl. var. ‘Camdeni’.